Vision Sports Publishing may only have been in existence for around eight years but they have an excellent reputation in producing quality sports books and aim to appeal to the many sports fans with quality titles which the staff themselves, as firm sporting fans, would like to read. If Clive Batty’s The Ashes Miscellany is anything to go by, they certainly seem to be on the right track. 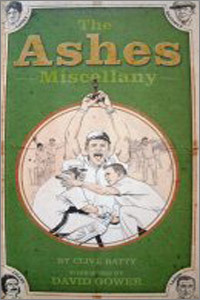 This beautifully presented and very well bound little book has a wealth of statistical, informative and, quite regularly, amusing entries and anecdotes covering the vast history of The Ashes. There is so much of interest within this book. The concise articles and sketches include everything from the origin of England and Australian cricket through the results and statistical highlights to some of the less flattering quotes made at opponents. The reader can find which players have taken a wicket with their first Ashes ball, read about the many legends of The Ashes through the years, man of the match awards and players carrying their bats amongst many statistical items. If looking for out of the ordinary information, there are mentions of knighted cricketers, cricketers who shared the same names with others in different walks of life and nicknames given to certain cricketers. Should the reader be interested in those who took their own lives, this too is mentioned as are the legendary Ashes tales such as David Steele going down one flight of stairs too many on his debut. Ted Dexter’s little ditty in an attempt to revive England’s flagging fortunes in the 1989 series is also reproduced. It is nice to see that it is not only the menfolk who are mentioned. Our ladies may not play many Tests but their Ashes records are mentioned also. In short, if your interest is in the statistical side, knowing what Robin Smith and Merv Hughes thought of you in a memorable exchange or simply finding out more about this most famous of cricketing rivalries, go out and buy this excellent book.